Last weekend one of our good friends, Cody Holmes, was in town to meet up with his GF and we ended up hanging out all day Saturday! Cody wanted to hit up this place Lucky 13 in SLC to compete in their food challenge. Two sandwiches. 58 minutes. $200 on the line. Ryan ended up getting "The Bear", one of the 2 sandwiches that Cody would have to eat in his competition. 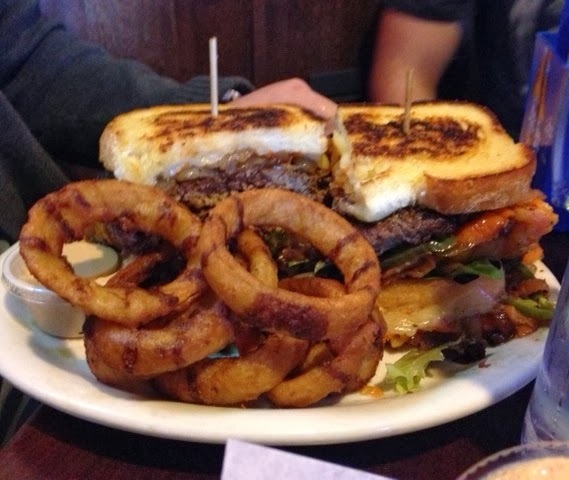 "The Bear" was 2 grilled cheese sandwiches, with a 14oz meat patty in the middle. The meat had been mixed with habaneros, there were habaneros on the sandwich, AND a habanero hot sauce. Keep in mind that both Ryan and Cody served LDS missions in Honduras and aren't new to spicy/hot food. 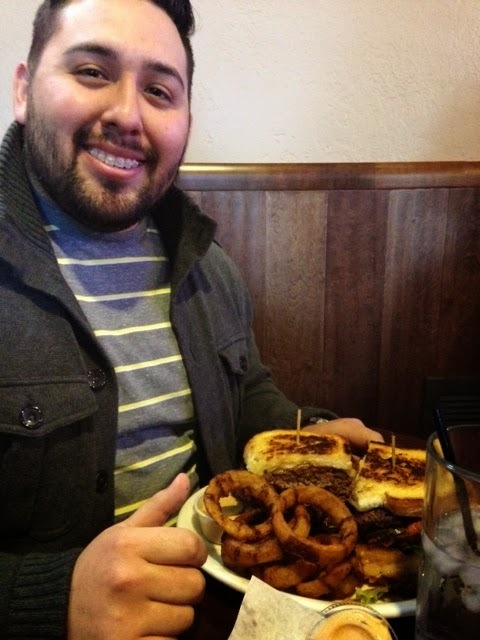 He ate the burger on the left in less than 15 minutes, and was setting a good pace for himself. He got to "The Bear" and only ate about 1/8th of it before his eyes got insanely bloodshot and he was running for the restroom. Cody and Ryan for the rest of the night kept on yelling "What did we do to ourselves?!?!" We came back to the house and they laid in the fetal position on the floor for a good hour before having the strength to get up. Even the day after Ryan was just puttering around because he could still feel the fiery burn of habaneros in his stomach! Haha…hilarious! Boys will be boys, right?! We still need to try the Ice Castles. They look so amazing!